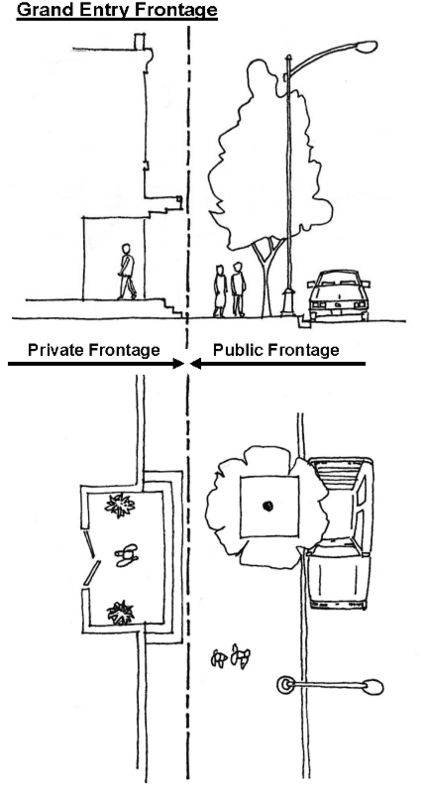 Private frontage types described below represent the various options for building forms and associated improvements at the principal frontage. The applicability of private frontage types to specific zones is shown in Tables V-1, V-2, V-3, V-4, and V-6. 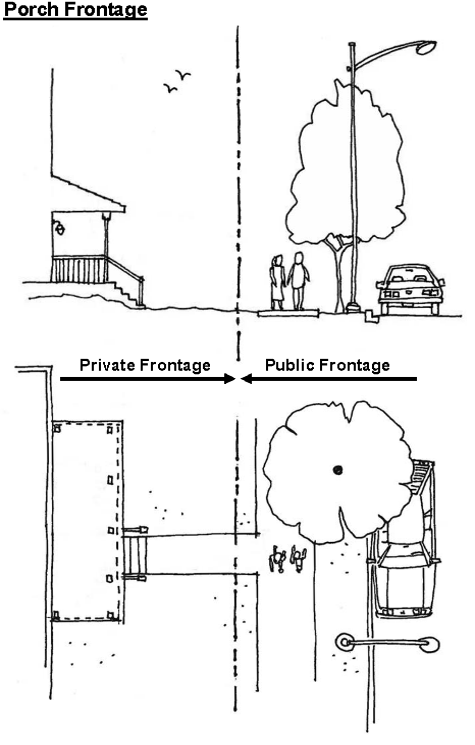 (1) Common yard: A common yard is a frontage wherein the façade is set back from the principal frontage line to provide a separation from the public right-of-way for privacy and private open space use by the residents. The front yard created remains generally visually continuous with adjacent yards, broken only by landscaping and minimal fences. Common yard frontages are characterized by landscaping. (2) Porch: A planted frontage wherein the façade is set back from the frontage line with an attached porch permitted to encroach into the front setback area when expressed as a separate mass appended to the primary building plane. A porch is a roofed space, open along two or more sides, and adjunct to a residential building, commonly serving to shelter an entrance and provide a private outdoor space. (3) Terrace or Lightwell: A frontage wherein the facade is setback from the frontage line by an elevated terrace or sunken lightwell. This type buffers residential uses from sidewalk activity. A terrace frontage may incorporate a podium parking structure when the setback area is landscaped to fully screen the parking structure. (4) Stoop: A frontage wherein the façade is aligned close to the frontage line with the first story elevated from the sidewalk sufficiently to provide some privacy for residents. The entrance is usually an exterior stair and landing. This type is recommended for ground floor residential uses. Stoops may feature a weather protection at the top of the stair and may encroach in the front setback area but not into the right-of-way. 5) Corner Entry: A frontage creating a distinctive building entrance to emphasize the corner of a building. 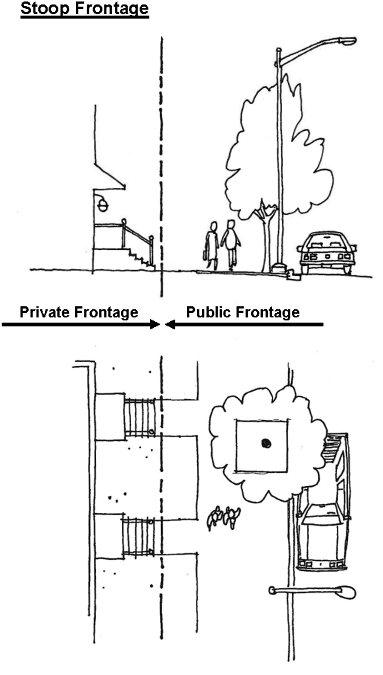 The frontage should create an open pedestrian area extending from the public sidewalk to the entrance. Architectural elements should place significant emphasize on the corner of the building. These elements may include façade projections or recessions, balconies, roof articulation, and changing repetitive façade elements such as window type but in all cases should promote a prominent entrance. 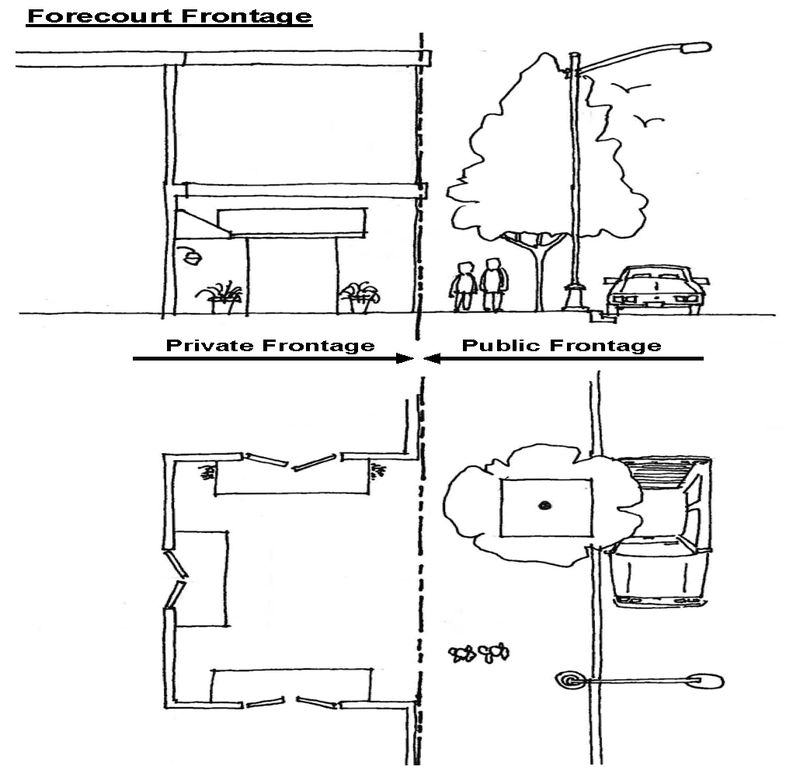 6) Forecourt: A frontage wherein a portion of the façade is close to the frontage line and the central portion is set back, creating a lingering space extending from the public sidewalk. 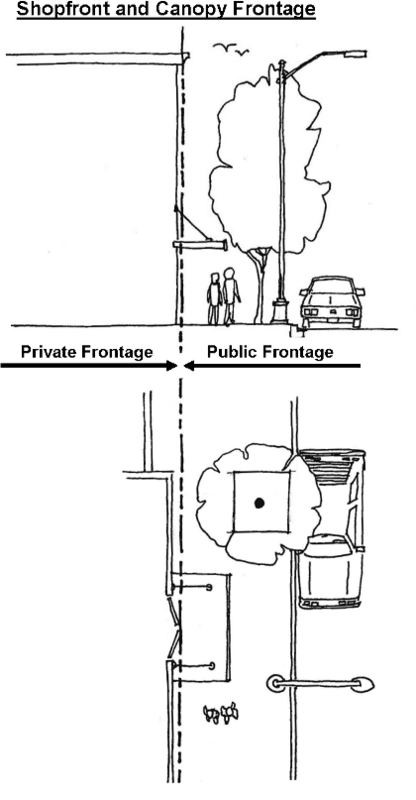 The forecourt may be used in conjunction with other frontage types. The forecourt opening shall be a maximum of 30 feet wide. 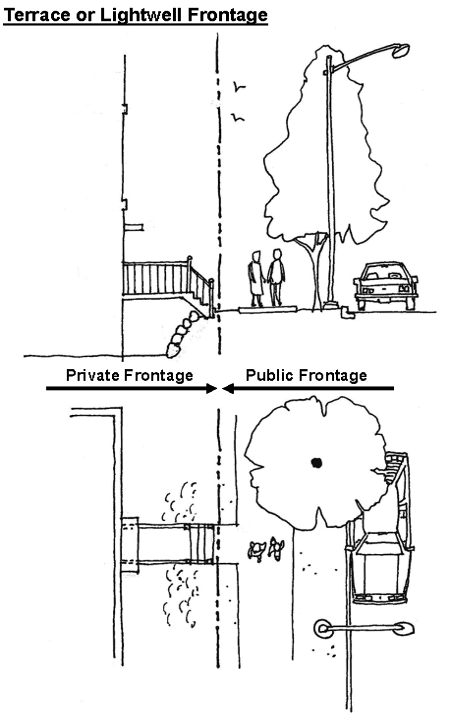 It may feature a decorative wall or fence on the sidewalk side that creates a gateway to the forecourt, but should appear as public space. A forecourt can be appropriate for ground floor or upper floor residential uses when combined with stoops, or can be combined with storefront frontage types. When combined with retail, restaurant, and service uses, all three sides of the courtyard shall feature shopfront entrances and display windows and the forecourt must be treated as an extension of the sidewalk space. (7) Shopfront and Canopy: A frontage wherein the façade is aligned close to the frontage line with the building entrance near sidewalk grade. This type is conventional commercial configuration that allows display of merchandise and direct access from the public sidewalk. Each shopfront shall contain at least one building entrance with a canopy that may overhang the sidewalk. Each shall have substantial, clear-glass display windows framed within storefront pilasters and base. The interior of the building shall be designed to provide either a clear view of activities within the building or a minimum 3-foot depth of display area. 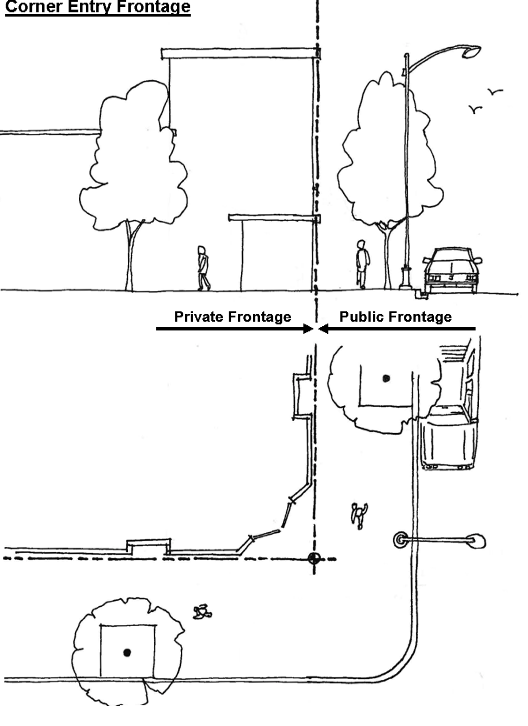 Any areas between the building and the sidewalk shall be treated as an extension of the sidewalk. The shopfront frontage type is specifically intended to provide block frontages with a multiplicity of doors and display windows. (8) Grand Entry: A frontage wherein the façade is aligned close to the frontage line with an entrance raised above the sidewalk and set back from the façade to create a formal entry feature. This frontage type is appropriate for access to a centralized lobby. The setback may be paved or landscaped or a combination of the two.